Equestrian statue of prince Eugene de Savoy (1663 - 1736) at Buda Castle, Budapest city, Hungary. 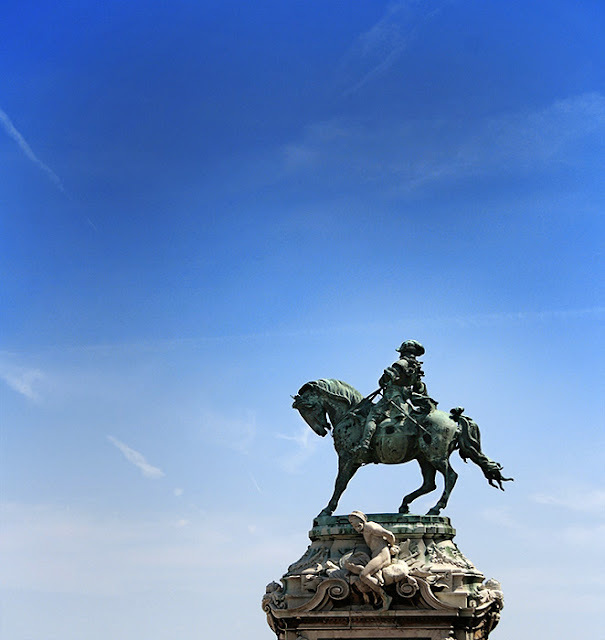 The equestrian statue of Prince Eugene of Savoy stands on the Danube terrace, in a prominent position, high above Budapest. The Neo-Baroque statue was made by sculptor József Róna for the town of Zenta but the town could not afford its price. The monument was bought in 1900 as a temporary solution until the planned equestrian statue of King Franz Joseph was completed. This never happened so Prince Eugen remained on his plinth. This plinth is decorated by two bronze reliefs, showing the capture of the earth-works in Zenta and the decisive cavalry charge in the famous battle in 1697 (source Wikipedia).